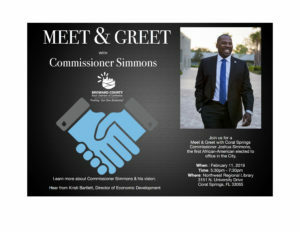 Join us for a Meet & Greet with Coral Springs City Commissioner Joshua Simmons. He is a newly elected official and the first African-American to hold elected office in Coral Springs. Learn more about him and his vision. We have also invited Kristi Bartlett the Director of Economic Development for the City of Coral Springs. She will discuss the process of doing business with the City and answer questions.